I still find it hard to believe that i’m holding this game in my hands. I was convinced Stick of Truth would find itself on the top of a heaped bonfire of development hell. It seemed destined to fade into obscurity and remain a pipedream for fans of the show. But it’s real. Stick of Truth has gone gold and it’s almost ready to leap off store shelves into your paws. This is the first thirteen minutes of gameplay. Obvious spoilers ahead so if you want to go in fresh, please don’t watch. Games don’t really make me laugh anymore. Sure, i’ve shed a few tears during soppy scenes and barked angry slurs at the screen when things aren’t going my way. But laughter? Most games are lucky if they can get me to smirk at a sneaky reference or clever spin on wordplay. South Park The Stick of Truth made me laugh out loud at least ten times during its opening ninety minutes. And right up until the end, the game continued to have me in stitches. Sometimes I felt guilty for that laughter, especially when some of the humor was treading more controversial lines, but the way it is all brought together in videogame format is never ‘too much’ and on the whole, borderline genius. Would you also believe it’s actually funnier than most South Park episodes in recent memory? Matt and Trey have clearly been saving up their best material over the last few years. In most RPGs, I’ll start out as a warrior. I never feel quite confident enough to be a caster and a rogue can be a bit squishy depending on the game. But for the purposes of overviewing the game and really giving myself an authentic South Park experience, I rolled the Jew class. It didn’t take long for Cartman to make a joke about money. After customizing my South Park character to look as much like me as possible and sticking with a class, I was ready to start exploring. 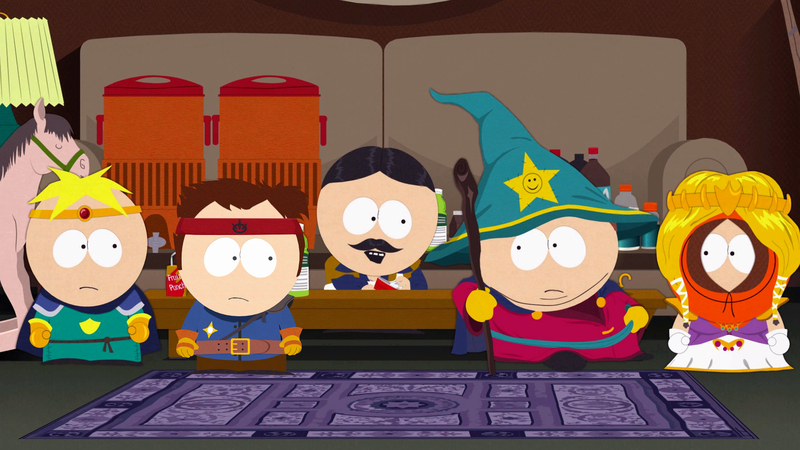 Cartman – or should I say the Grand Old Wizard – tells me about an eternal battle between humans and elves over The Stick of Truth. He who has the stick holds the power apparently, but what Cartman didn’t tell me is that i’ll be fighting over and protecting a pointy old twig. Much of Stick of Truth requires you to wander around South Park, interacting with the residents, picking stuff up and completing quests. You’re new in town and your father isn’t interested in talking to you unless you make friends. This is where the in-game Facebook tool comes into play. With it, you’ll add friends and see a timeline of their statuses appear in the menu. Most of the time you’ll get a ridiculous, character-esque status that will raise a smile, but in others there’ll be some mission text included. There’s even a South Park character that turns out to be a serial spammer. The game is full of references to all forms of videogame culture. As you wander around South Park, you’ll pick up bottlecaps – an obvious wink at Fallout – but you’ll also use Dragonshouts on your enemies. There’s even a Guitar Hero guitar in one of the garages if you look close enough. And of course, there’s that special brand of South Park humour – whether it’s catching Gingivitus from a ginger-haired Hall Prefect if they bite you or Mr Hanky The Christmas Poo getting into a family domestic with his children because they don’t believe he’s their real dad – there’s a bellyfull of laughs to be had in this package. Farts actually poison your enemy and cause them to lose health through forced regurgitation. But farts can also add additional power to attacks, and even set an enemy on fire if a flaming arrow is also used. 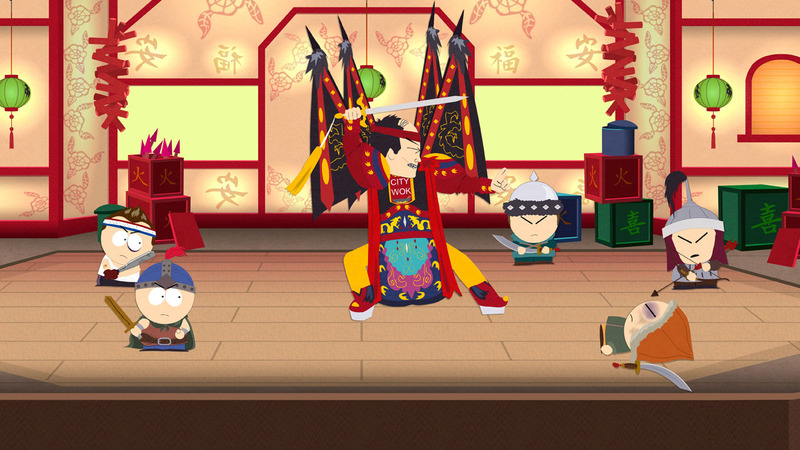 Standard RPG turn-based battle fare, but with added South Park flare. But there are other quirks that definitely set this apart from anything else Obsidian, or indeed, any other RPG developer has done before. For instance, as a Jew, you can cause your enemies to bleed out by – wait for it – circumcising them. And surprisingly, it all comes together really well. You can still change out your weapons, swap your attire for different effects and armor boosting, and even add unique effects to your weapons with purchasable ‘strap-ons’. The only frustrations to be found here are the censorship issues for us EU gamers. There is an entire section that feels the lack of punchlines because the game has been censored. It loses some of its impact because of that and slightly destabilizes the momentum of the game. Unfortunately, this happens several times, but fortunately never quite long enough to outstay its welcome. To be honest, we’re still not quite sure why any of the content was censored. I’d argue worst things actually avoided the cut. The Stick of Truth is also a lot shorter than you might expect. Providing you take your time, explore everything and try to get the most possible out of the game, you’re looking at around 12 – 15 hours of gameplay. For a quick storyline rush-through, however, it’s more like 8. I do think the game could have benefitted from a few more side quests and slightly more content, but the story itself is perfectly paced as is. Any more would overstretch it and any less would feel lacking. But more side-quest padding could definitely have helped give this game just a little bit more. What I do know is that when the game was apparently ready to launch a year ago, it would probably have been buried and forgotten about. Ubisoft buying this game from THQ was probably the best thing to happen to the license and the end-product. The result is that Stick of Truth is fantastic and the game remains consistently entertaining from start to finish without a single dip in quality. Whether you’re a casual SP fan, a regular viewer or even if you’ve never watched it at all, The Stick of Truth is one of the funniest games we’ve played in years and a pretty bloody solid RPG to go along with it. Future DLC giving us more side quests? 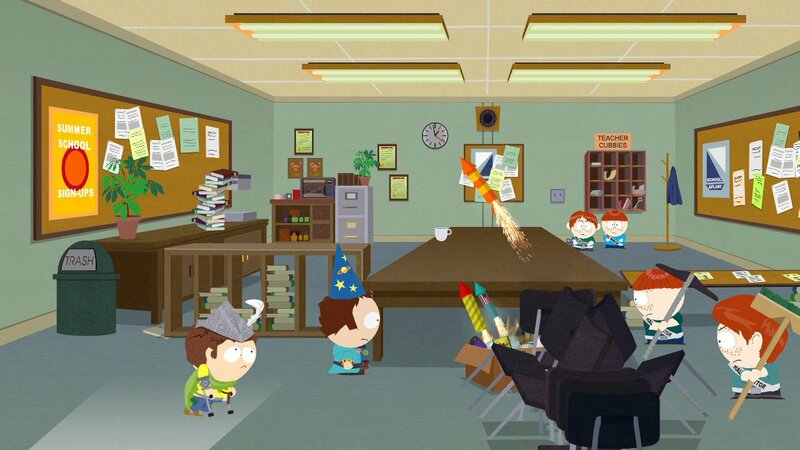 The Stick of Truth hits all the right notes and makes no obvious technical errors. Where Obsidian have been known to make errors in judgment and mistakes in their past games, Ubisoft’s QA have helped shape up this product magnificently. The odd slight error here or there causes no issue for us and in a year where we’re expecting some of the best RPGs we’ve ever laid eyes on, The Stick of Truth can hold its head up high as something pretty special in its own right. Fartuitiously fantastic!